Looking for a delicious, hearty and easy meatless dinner recipe? 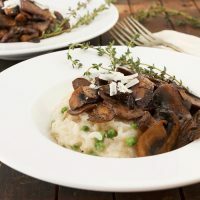 This Baked Parmesan and Pea Risotto with Marsala Mushrooms cooks in the oven, you can quickly cook up the mushrooms. Put it all together and enjoy! 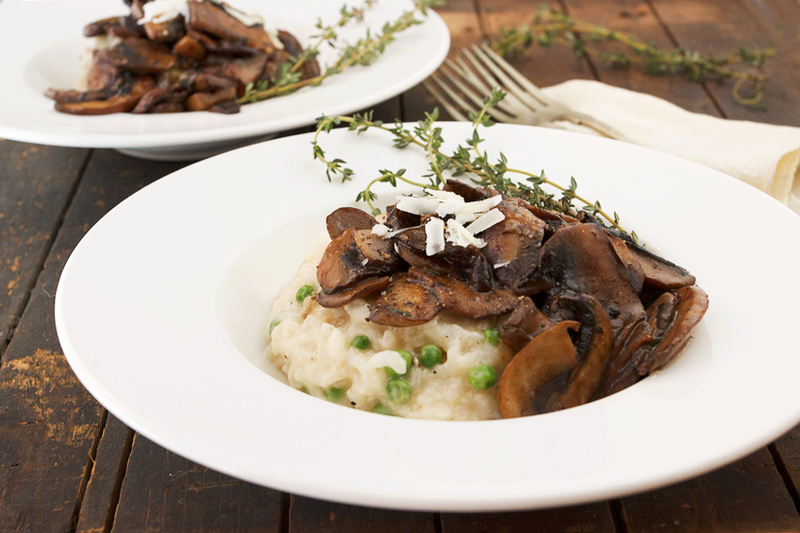 This Baked Parmesan and Pea Risotto with Marsala Mushrooms is one of my favourite meals. It also happens to be meatless. It’s hearty enough for my husband’s appetite and I love how easily it comes together. Much of the credit for that goes to the fact that the risotto is baked. 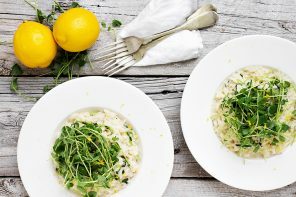 It’s a great time saver and the result is a pretty darn nice risotto. 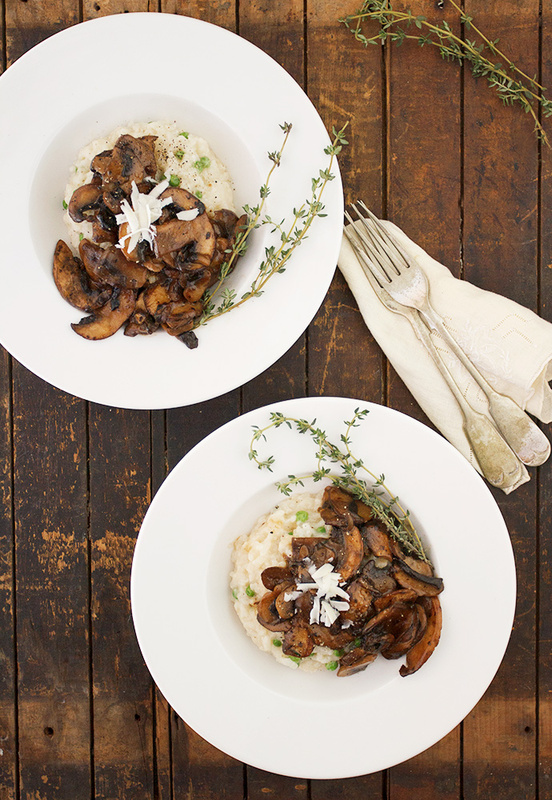 While the risotto cooks in the oven, just grab a skillet and quickly cook up the mushrooms. They’ll be done right about the time the risotto is done. Put it all together and enjoy! 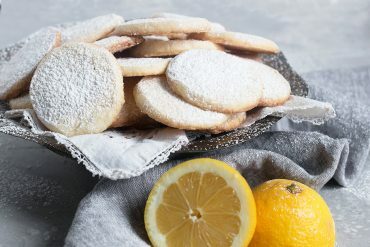 Be sure to check out the Cook’s Notes below the recipe for more tips for this recipe! Be sure to season both the mushrooms and the risotto well, with salt and pepper, to really bring out the flavours. If you don’t have or don’t want to use heavy cream in the mushrooms, use a lighter cream or milk and increase the amount of cornstarch a bit, to compensate. For perfect timing, start the mushrooms after the risotto has been in the oven about 20-25 minutes. That way the mushrooms don’t have to sit or be re-warmed, which can cause the sauce to disappear a bit, as it is absorbed by the mushrooms. Marsala wine is available with the Italian wines. I use Sperone Dry Marsala. If you don’t have or want to use wine in the risotto, just omit. You could add a splash of lemon juice though, if you have some, for a little acidity. A delicious meatless main dish that is hearty enough to satisfy all appetites. Be sure to season the finished dish well, to bring out the full flavours. For perfect timing, start your mushrooms after your risotto has been in the oven about 20-25 minutes. 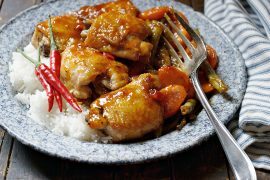 Preheat oven to 350° F. Heat chicken stock in microwave or a saucepan. Place an oven-safe Dutch oven on the stove-top over medium heat. Add butter and melt. Add onion and cook, stirring, until softened. Add rice and cook, stirring, for a minute or so. Add wine and allow to cook off for about 2 minutes, stirring occasionally. Add heated stock and stir to combine. Cover with lid (or tightly with aluminum foil) and place into oven. Bake for about 45 minutes, or until most (but not quite all) of the liquid has been absorbed. Meanwhile, place a skillet over medium-high heat. Add butter and melt. Add 2/3 of the mushrooms and a light sprinkling of salt and cook, stirring, for several minutes until much of their liquid has cooked off. Add the final 1/3 of the mushrooms and cook, stirring, until softened and deep golden. Add thyme leaves and stir to combine. Add marsala and allow to simmer for about 2 minutes, to allow the alcohol to cook off. add the broth and stir to combine. 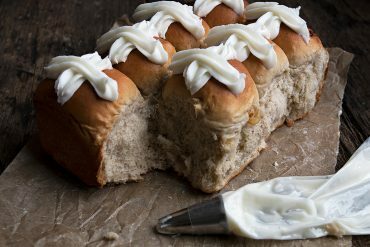 In a small bowl, stir together the cornstarch and cream. Add to the skillet and cook, stirring regularly, until sauce is warmed and thickened. Taste and season with salt and pepper, as needed. (Turn of heat under mushrooms if necessary and re-heat when risotto is done, if done well before the risotto). When risotto have baked for 45 minutes, remove from oven. Stir in Parmesan cheese and frozen peas and stir well for a minute to combine. Cover with lid and allow to stand for a couple of minutes. Remove lid. 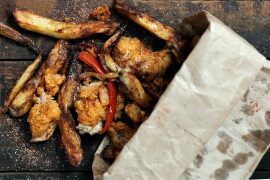 Taste and season with salt and pepper, as needed. Add a splash more broth, if risotto is too thick. To serve, spoon risotto into the bottom of a shallow bowl. Spoon warm Marsala Mushrooms over-top. Garnish with freshly grated Parmesan cheese and some sprigs of thyme, if desired. Haha I WISH I had the spring cleaning bug…. 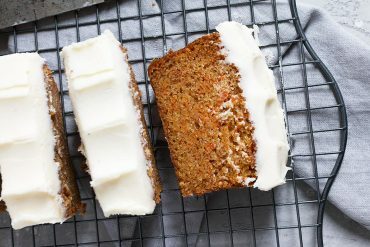 I *should* be inspired by your cleaning, but instead I’ll just be inspired by your recipe ;) This looks amazing!! This dish! Wow. It hits that perfect balance between upscale chic and earthy comfort food. And those mushrooms! They are calling my name – I just love mushrooms so much. And I hear you about the spring cleaning. I went through my kids the other day and I’m sure it’s time for our hall closet, too. 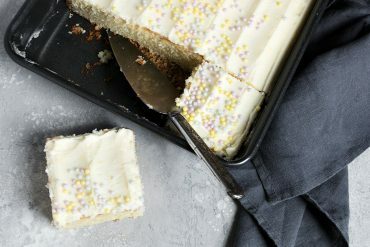 Who needs meat when you can have THIS?! 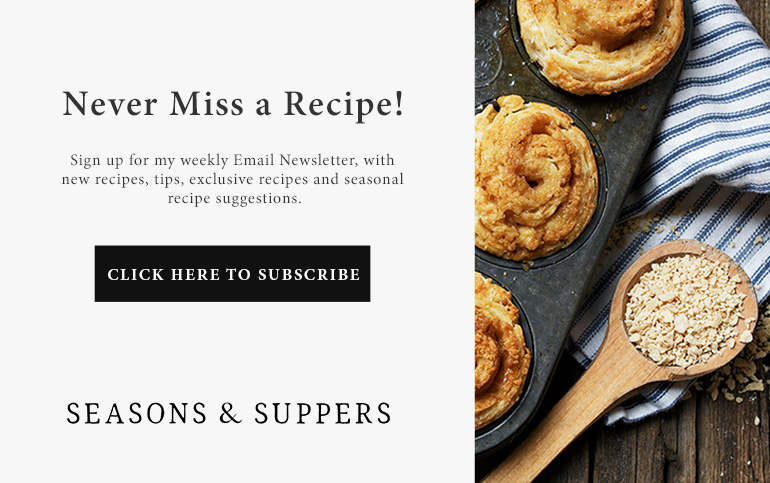 I love baked risotto – so easy- and yours looks seriously delicious! LOVING the marsala mushrooms in here, Jennifer! So flavorful and perfect for dinner any day of the week, not just meatless monday! Cheers, friend! Oh my goodness, Jennifer, such a delicious dish! I love mushrooms and I’m always looking for dishes in which they are the main star. I’ve got the cleaning bug too and now that it’s going to be super warm today I don’t know how I’m going to work on my bog when all I want to do is tear open every drawer and cupboard in the house, lol. I’m always captivated by your photos! 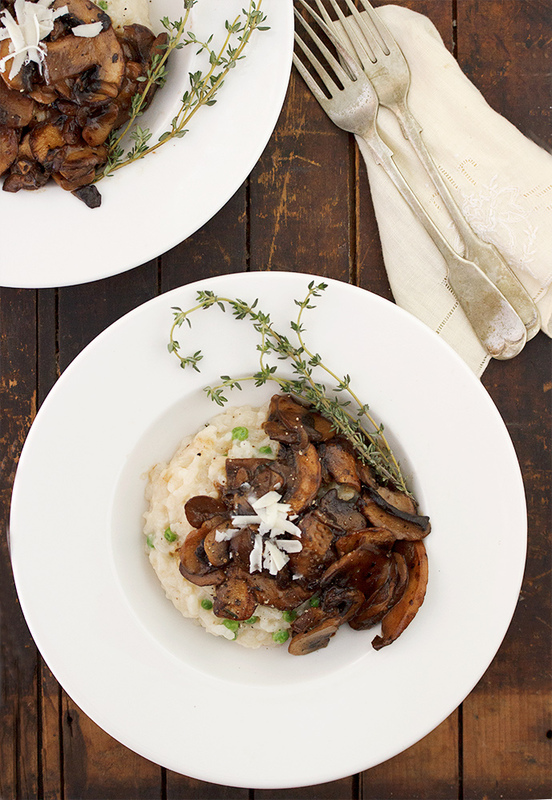 I love risotto and those marsala mushrooms are absolutely mouthwatering! Thanks Mary Ann and I’m sure you would both enjoy this one! Tom and I LOVE risotto Jennifer, and anything with mushrooms AND marsala wine is a total hit! this looks like a bowl of comfort to me… just pass me a fork, I’m dying to dig right in! This is a dreamy dinner – on any night! You know I LOVE meatless Monday meals so thanks for giving me enough time to put it on the Monday rotation! I agree with Chris – the spring cleaning bug has not hit me yet – so please share! This is beautiful Jennifer – like all your posts, you cook like I want to eat! Thanks Tricia :) The Spring cleaning bug hits hard it. It’s a long winter and the dust bunnies have lots of time to multiply! Could you please pass on the cleaning bug to me? Everything in my house needs to be purged but I’m not there yet. Yum, this risotto looks wonderful, I can’t imagine anyone missing the meat! 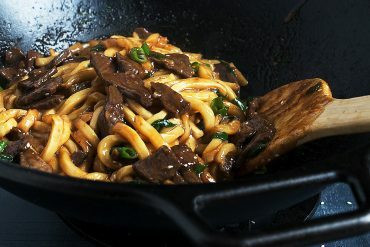 Marsala and mushrooms, yes please! Hearty mushrooms are the only veggie my husband will accept as a stand-in for meat, so this needs to happen here at our house, and I really need to get at my closets — but not before I make this polenta…I’ll need my strength! Sounds nice. Thank you and have a great day in Muskoka. Thanks Liz. Spring is in the air in Muskoka :) You have a great day, too! Those mushrooms are SCREAMING “make me!” to me right now. So delicious! I just made a version of this over the weekend, but didn’t bake it – I’ve always wanted to try baked risotto!